We've all struggled to find pictures at some point. MediaDex attempts to eliminate this problem. Principally aimed at photo management, but also able to handle other file types including movies, it comes in Standard and Professional varieties. The main difference between the two is that the £55-Professional edition can handle PDFs, Microsoft Office files and RAW images. Superficially, MediaDex is similar to iPhoto, although not as pretty. It enables you to import files into catalogues, storing thumbnails when it can. As well as thumbnails, it also includes metadata - information about the files, such as dimensions, creation and modification dates and so on. It can also can handle EXIF and other metadata standards, such as IPTC, which can include data about the digital camera used to take the picture, captions, headlines, and so on. You can then search through the catalogue using a simple search interface (or a more complicated SQL-like process) that enables you to string these fields together. 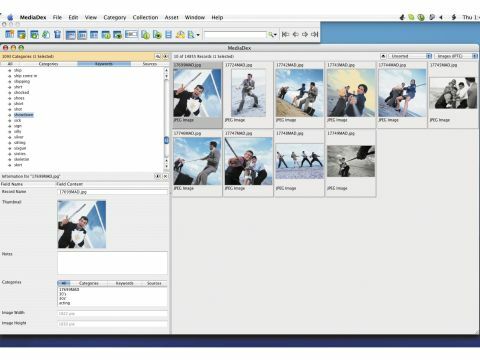 MediaDex also enables you to categorise the photos and add keywords. If the photos already contain keywords, MediaDex will import them and tag them appropriately. There are also a variety of export options, including slideshows and web albums, as well as batch processing features for renaming, converting and editing files. All the same, despite its power and the speed with which you're able to search, it's hard to recommend to the home user. Unless you're prepared to add keywords to every photo you own, you're going to be in no better a position after investing in MediaDex than you were before. MediaDex is a solid tool for professionals, but home users should stick with iPhoto.